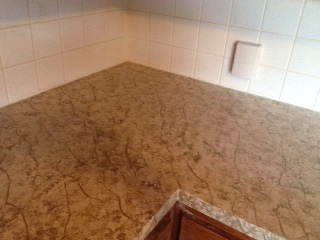 This is a faux marble technique applied to a counter top. 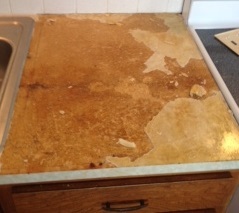 As you can see, there was extensive damage to the existing counter top. 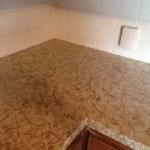 This saved the customer $thousands$ in replacing counter tops in their rental property. 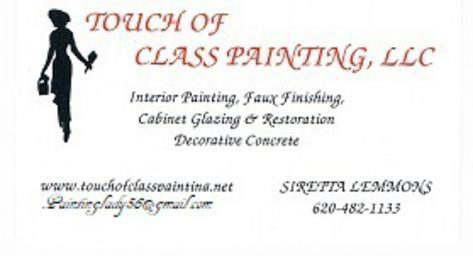 A Faux Finish is a wallcovering technique utilizing paint, specialty glazes or applications, a variety of decorative artists tools and many steps and processes. The word Faux in French means 'fake' or 'false; thus the Faux Finish gives the illusion of something that is either expensive, difficult to replicate, or created to look like something else. For example, a Venetion Plaster in the right color scheme can be applied to your wall to create the look of marble. 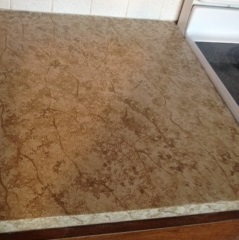 Or a wall can have the illusion of a textured wallpaper such as with the Leaf teqhnique. Leather or Suede are a few popular looks to add depth and demension to your room. The dramatic appearance of crackle takes on the characteristics of aged metal patina. Tissue Paper from afar has a subtle texture, however, it gives way to a stucco or cement appearance. ​When it comes to Faux Finishing, deciding the right technique and color scheme for your desired effect can take time. Ask for a free consultation, we are more than happy to help you achieve a look that will set just the ride mood of your choice.